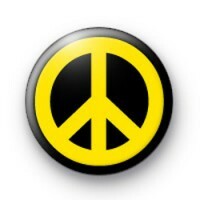 Yellow CND Peace Badge in black with a large yellow peace symbol. These badges are inspired by the CND (Campaign for nuclear disarmament) campaign from the sixties which still exists today. A cult button badge design going right back to the 1960's and the hippy movement. We have a great range of peace badges, CND badges and other pacifist & political themed badges available. Have a search or browse through our categories. We also have a great range of political badges in our patriotic, political & religious badge category. Standard 25mm badge made in our UK workshop.